The Government decided to undertake Voter Registration along with their photographs, finger print and signature. The Bangladesh Army commenced the creation of suitable people identification system to give the Voter registration process a head start. International and local firms, academic institutions offered solutions. On invitation Dohatec proposed a solution for gathering voter data on laptops with web cam, finger print scanner and signature pad to the army. Dohatec developed the required solution and gave shape to the imagination of the concerned authorities in a week’s time. Within two weeks there was a system for the Army to try out. The government high-powered committee considered and recommended this solution. A total of 80 100 million voters in the country. The system is in Bangla language the operators at local level learn to use the system easily including use of biometric data gathering system. The trainers are personnel from the Army. SDK from Neurotechnologija, provided by the Army to Dohatec, was used to integrate the AFIS solution. Dohatec solution comprises of the electronic Voter Registration and ID software - ‘eRegistry’ and the higher level matching software – ‘Biometrics Fusion Server’. Microsoft examined the system and found it a robust solution and gave it worldwide focus. The Pilot Project went off successfully. Large scale matching solution has been provided since. Congratulations to All for 9th National Parliamentary Election 2008 based on Correct Voter List: Dohatec – Developers of Multi-Biometric Duplicate Detection and Voter Registration Solutions. 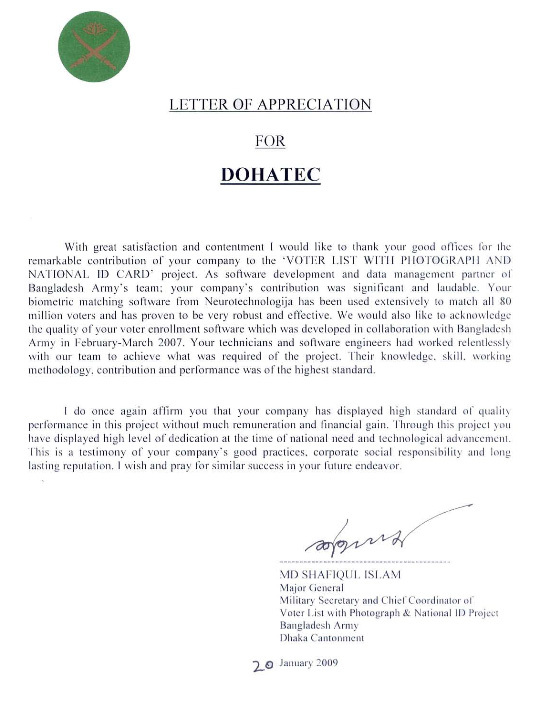 Dohatec provided Bangladesh Army the Voter Enrolment and People’s Identification Software. Dohatec provided the first Prototype comprising of Digital Voter Entry Form including photograph and fingerprint capture based on laptop with Microsoft Operating System. The desktop data matching software was given to Bangladesh Army within March 2007. Developments as desired by Bangladesh Army were incorporated throughout the process of finalizing the data requirement with Bangladesh Election Commission. Dohatec Voter Enrolment Software along with the laptop, web cam and fingerprint scanner integration was the only solution that was approved by the Government of Bangladesh on 26 May 2007 following demonstration by army officials to the Chief Advisor, cabinet members, Chief of Army, Chief Election Commissioner. This efficient and robust system could be used with any AFIS system that the client would select. 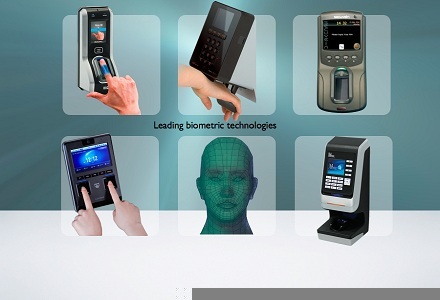 This is a large scale applications intended for the development of large-scale AFIS and multi-biometric face-fingerprint identification systems. The MegaMatcher technology is MINEX-certified and allows the use of either a fused face-fingerprint recognition algorithm or fingerprint and facial recognition engines separately. The fused algorithm matches up to 400,000 records per second with outstanding reliability. MegaMatcher 2.0 is one of only 12 algorithms worldwide to receive full MINEX certification for both fingerprint template encoding and matching. This certification puts MegaMatcher 2.0 SDK into the U.S. government buyers' certified list of fingerprint recognition algorithms. A total of 46,525 voter were enrolled using the approved Voter Registration and National ID Solution provided by Dohatec. The Mobile Enrollment Units using Dohatec Solution enrolled 70% of the total number of voter. Dohatec collaborates with international companies in the securities space, providing a rande of services in enrolment solutions, multi biometrics and de duplications. 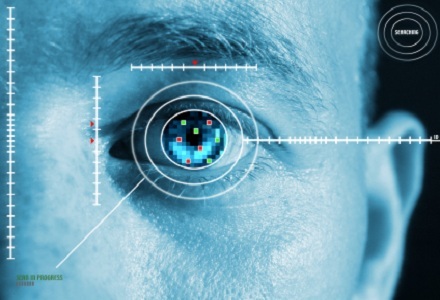 It has cooperated with companies for projects in the Identity space and in Registration. 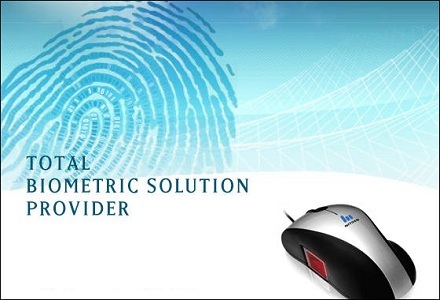 It has middle ware that is used for processing large number of records for multi biometric de duplication. Dohatec worked closely with Neurotechnology since 2007. Dohatec provided solution to Dan Office who have worked Kyrgyzstan, Tanzania and Pakistan. Dohatec has cooperated with Morpho Sagem in several opportunities including MRP in Oman. Dohatec has explored opportunities with Bundesdruckerei Germany, , Trub , Suprema Republic of Korea, Iris ID USA, and Innovatrics.